When the temperatures start to fall, I can’t wait to get soup on my menu. This one combines some of our favorite flavors. Anything with bacon can’t be bad as far as I’m concerned! In a large Dutch Oven or heavy bottomed pot, cook the bacon over medium heat until crisp. Remove from the pan and set aside on a paper towel lined plate. Drain all but about a tablespoon of bacon grease. (Reserve bacon grease if desired for the pretzel croutons.) Add the ground beef and cook for about 3-4 minutes until it is beginning to brown. Add the onion, celery, carrot, jalapeno pepper, and minced garlic. Continue cooking until beef is cooked through and drain any excess grease. Add in the beer, beef broth, tomatoes, Worcestershire sauce, Dijon mustard and pickle relish. Simmer for about 10-15 minutes. While the soup is simmering, melt the butter in a medium sauce pan. Whisk in the flour and make a roux. Cook for 1-2 minutes until bubbly, whisking constantly. Slowly add the milk a little at a time. Allow it to simmer for a few minutes until slightly thickened. Remove from the heat and add the sharp cheddar a handful at a time, whisking after each addition. 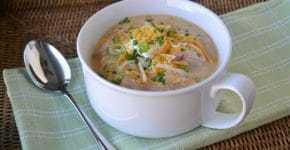 Gradually add the cheese sauce to your simmering soup and heat through. Don't let it come to a boil. Add kosher salt and pepper to taste. Dice the bread into pieces and mix with melted butter or bacon grease. Spread out in a single layer on a cookie sheet and toast in a 350 degree oven for 10-15 minutes until lightly toasted. Garnish with extra cheese, cooked bacon, and pretzel croutons. I agree, everything is better with bacon! 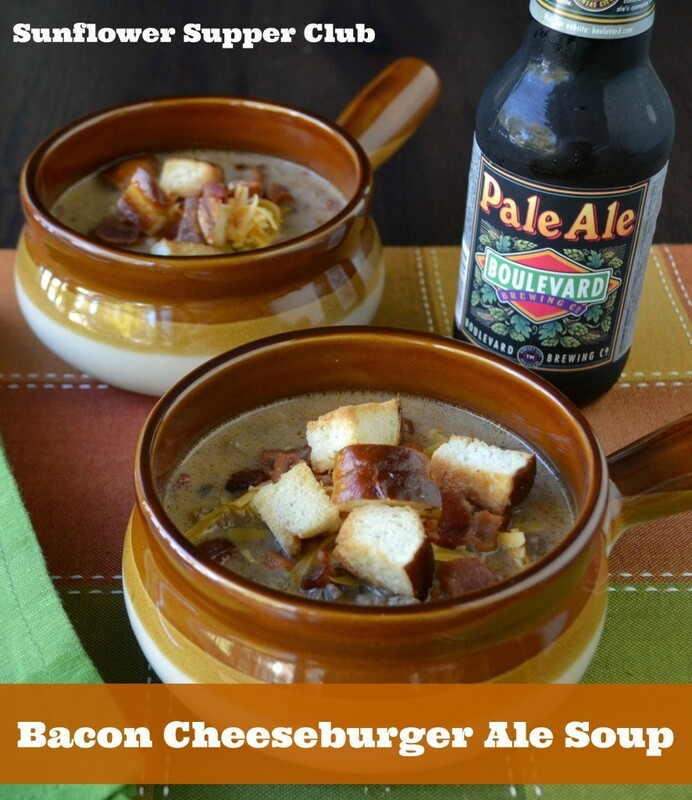 Do you know if there’s a way to make this without the beer? I’d love to know. Thanks for sharing on the weekend re-Treat link party! Hello Britni! I think you could easily substitute beef broth for the beer. I have also used O’douls non alcoholic beer in recipes when I need to make a dish without alcohol.